India is purchasing 22 Predator "B" drones from the US in order to fulfill an urgent demand from the navy. However, since the drones are strictly for reconnaissance, India is simultaneously developing on its own armed drones that can be used for surveillance as well as for precision strikes. New Delhi (Sputnik): The Indian government has initiated the procurement of 22 naval surveillance drones from the US for approximately $2 billion. The decision comes five months after the purchase proposal was approved by the Trump administration. "A request for Information (RFI) for Predator ‘B' Sea Guardian was issued to the US Office of Defense Cooperation on November 14 and the response is awaited," Subhash Bhamre, India's Minister of State for Defense informed the Parliament on Wednesday. The Minister also informed that the deal does not involve the transfer of critical technology to India. "Procurement of Predator ‘B' Sea Guardian is being progressed under Buy (Global) category and no transfer of technology is envisaged," Bhamre added. 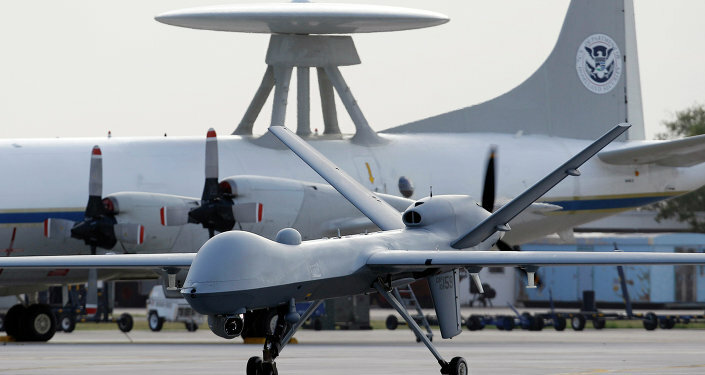 US Considers Sale of Armed Drones; But Does India Really Need Them? The MQ-9B Guardian UAV is a variant of the MQ-9 Reaper drone (also called the Predator B), but it replaces the Reaper's missiles with several radar platforms and is primarily meant for maritime search operations. On October 18, US Secretary of State Rex Tillerson clarified that the US was ready to share technology with India but would not part with some closely guarded defense technologies as it would hurt the country's competitive advantage. The Indian Navy is in dire need of high-altitude, long-endurance drones that can be used for surveillance as well as for precision strikes in the Indian Ocean Region. However, the 22 UAVs offered by the US are non-lethal in nature and can fly non-stop for over 27 hours for intelligence, surveillance and reconnaissance missions only. To fill this gap, India is developing its own drone "Rustom II." "The development of the Unmanned Aerial Vehicle (UAV) Rustom-II is an indigenous effort wherein the majority of sub-systems like airframe, landing gear, avionics systems, flight control systems and data link systems have been developed indigenously by various private industries," the Minister of State for Defense informed the Parliament. However, the propulsion systems and sensor systems of the Rustom II are being imported which the state-owned labs have promised to develop on their own at a later stage.